In April 1974 experienced Scottish mountaineer Hamish Brown set out to climb all 279 Munros (3,000 foot summits in Scotland) in one continuous walk, something that had never been achieved before. 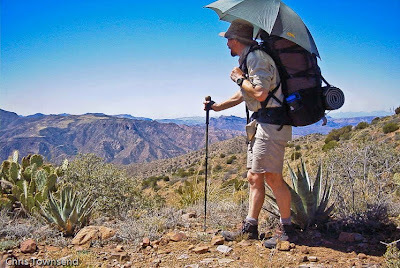 After 112 days, 1639 miles and 449,000 feet of ascent he completed the walk. Continuous rounds have been done quite a few times since - sometimes in winter, in much faster times and with the addition of other summits - but Hamish Brown was first. Four years later the story of his pioneering walk was published. I bought a copy as soon as it came out and read it several times over the next few years. This is one of the books that inspired me and my hardback copy is dog-eared and well-thumbed. 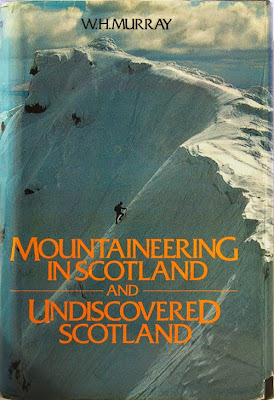 The book has been in print most of the time since 1978 but the last edition, published in a volume with Hamish’s Climbing the Corbetts, went out of print a few years ago. 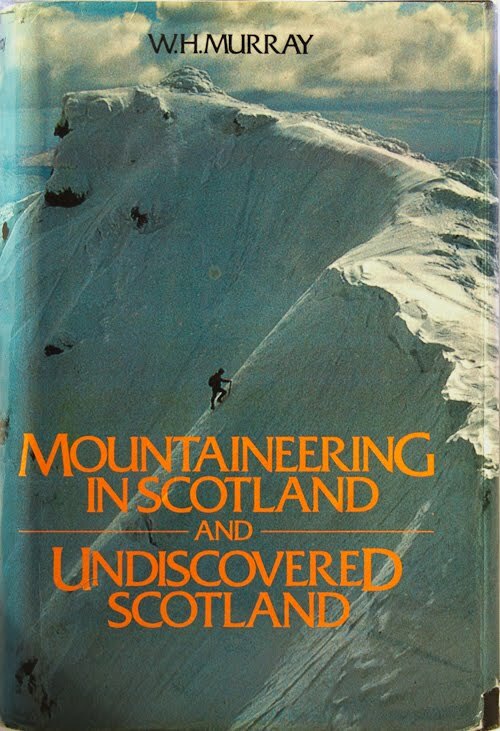 Now Sandstone Press has published a new and welcome paperback edition, making this classic book available to a new generation of mountain lovers. Whilst the story of the Munros round is at the heart of Hamish’s Mountain Walk and is an inspiring and exciting tale in itself there is much more than this in the book as Hamish covers history, geology, natural history and more as well as stories of people he meets and from his past taking parties of schoolboys out in the hills. This mix produces an entertaining, informative and enthralling story that is written with verve and passion. The latest edition has a new preface by the author and a selection of colour photos of the Scottish hills, many of which were clearly not taken during the walk. 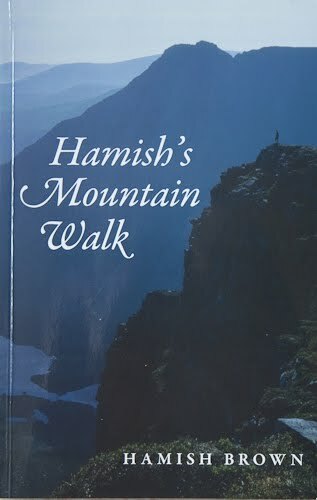 The original edition had black and white photos, which Hamish says are no longer available, which is a shame as they capture the feel of the walk well and show Hamish at various times during it, including on Ben Hope, the last Munro. The appendices from the first edition have been omitted too and I miss these even more. The statistics of the walk and the equipment and food used are still of interest and valuable for planning. Indeed modern ultralight and lightweight backpackers could well study Hamish’s gear notes and realise that it was possible to travel very light back before most of today’s lightweight materials were available. Yet Hamish’s pack averaged around 23 lbs, including food, and only twice went above 30lbs. 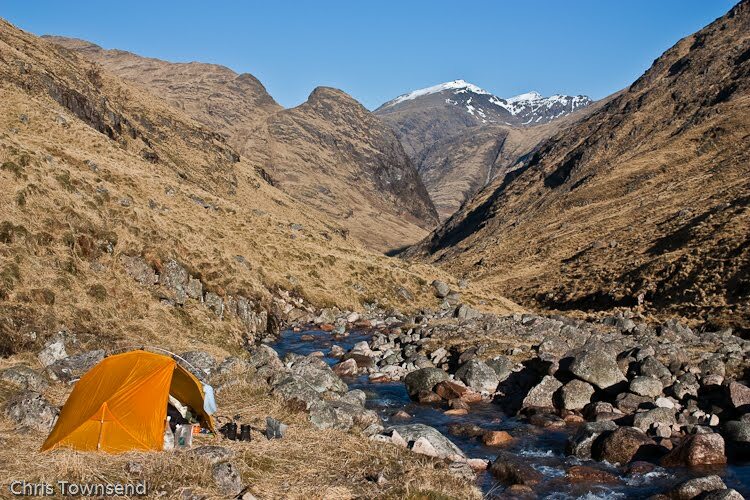 Most backpackers in the Highlands carry more than this today. Despite these omissions I welcome the new edition. 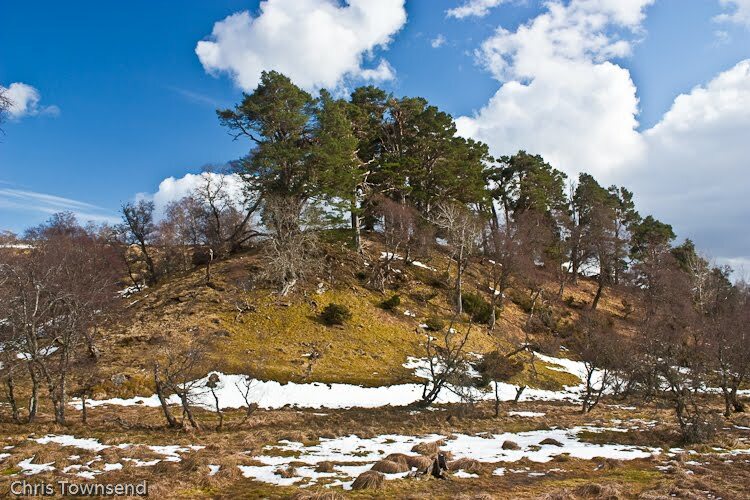 The story of the walk is still there, intact and untouched, waiting to inspire new walkers to explore the Highlands. As the equipment list is missing from the new edition here are some notes taken from the first one. Hamish’s pack - a Tiso Special - was a simple frameless bag with no hipbelt, no back padding and no pockets. His tent was a single-skin nylon ridge tent with a floating groundsheet attached by elastic tabs that weighed “a bit over 3 lb”. The heaviest item was his down sleeping at 4lb, which he says “gave reasonable weight/quality ratio” – at that time light downproof fabrics didn’t exist. Weight was saved by not bothering with a sleeping mat – “except on snow these are just bulky extras. 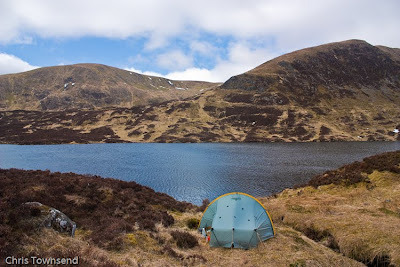 The rucksack, tent-bag, waterproofs and any spare clothes did just as well”. And this for a walk in the Highlands starting in early April. 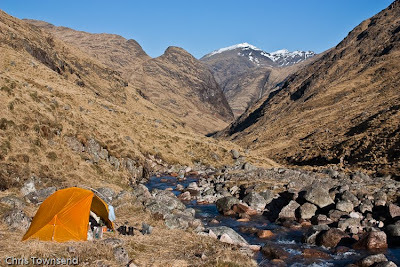 For cooking Hamish used a Camping Gaz Bleuet stove, changed for a solid fuel stove for a section where he used bothies instead of the tent, and a two pint pot whose lid doubled as a mug. His spoon was “edged sharp enough to cut” so he didn’t carry a knife or fork. His boots were “light, fairly soft” and with them he wore “good, soft wool stockings”. Clothing consisted of nylon waterproofs (non-breathable – this was before Gore-Tex), a long-sleeved Damart synthetic vest, a cotton shirt, a Shetland wool pullover, flannel trousers and a sun/rain hat. No gloves - long shirt sleeves pulled down did instead. 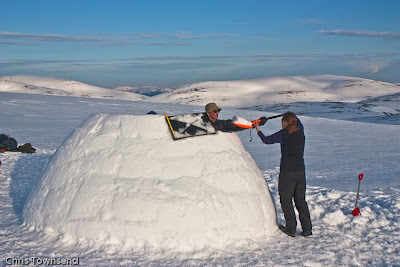 Nor did he have an ice axe even though there was still much snow on the hills. Instead, when necessary, he used iron fence posts or even rocks instead. The two photos above were taken five days apart. 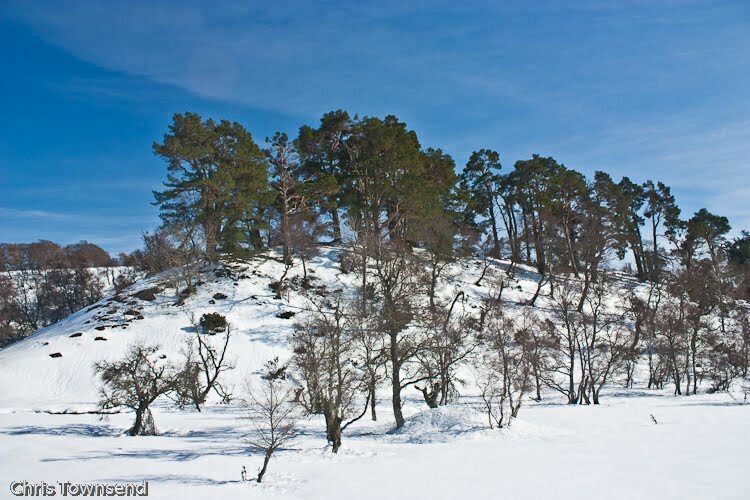 The first was during a ski tour from home after the heavy snow that fell at the end of March. 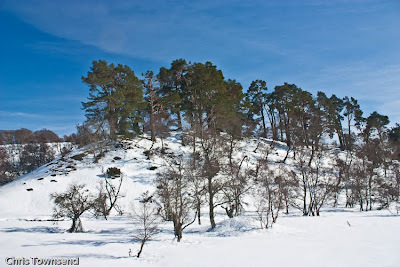 The snow was knee deep and it felt like winter, with a cold wind and the temperature below freezing. The waders that nest in the meadows in spring, which had been very noisy the week before, were gone, driven down to the lowlands and out to the coast by the blizzards and snow. Rabbits and roe deer had made tracks to grassy banks where they had scraped through the snow to gnaw at the frozen vegetation underneath. A few buzzards drifted overhead. Two roe deer high-stepped awkwardly through the deep snow in the trees. Usually they will speed away on seeing a person but for one of them this was too much effort and it sank down into the snow and simply watched me as I passed by. Then two days ago came rain and a warmer wind and a big thaw began, stripping the snow from the land and sending gushing streams down tracks and gullies and filling the meadows with pools of slush. Today I followed the same route and was amazed at how much snow had gone. The air was warm and there was colour in the land. The waders had returned and I listened to the cries of lapwings, curlews and oystercatchers and watched them whirling overhead. Songbirds called in the woods. There were catkins on the willows. Rabbits nibbled the freshly revealed grasses. No spring flowers had yet appeared, not even their leaves, but it did feel as though the season had changed. This time perhaps spring is really here. Photo info: Both photos Canon EOS 450D, Canon 18-55 IS lens, raw files converted to JPEG in Lightroom 2.6. Top photo 18mm, 1/125@ f8, ISO 100. Bottom photo 20mm, 1/160@f5.6, ISO 200. After two days of heavy snow and high winds the blizzard finally faded away sometime during last night and today has been sunny with high clouds and a NW breeze. Venturing outside I ploughed a way through the waist deep drift outside the front door. The bird feeders were almost touching the snow, enabling pheasants and blackbirds to peck at the peanuts. With snowshoes on I was able to walk over the garden gate, though I was still sinking in knee-deep. In the woods many more branches and trees have come down – the damage this winter has been severe. In the sunshine rabbits and pheasants were lined up on a bank at the edge of the wood nibbling the grass revealed as the top of the bank thawed in the sun. Great dollops of snow crashed down from the trees as they warmed up. The snowpack is wet and heavy and starting to pack down but there is so much snow it could still take days to thaw, especially as a hard frost with temperatures down to -10ºC is forecast for tonight. There is likely to be an icy crust on the snow tomorrow. 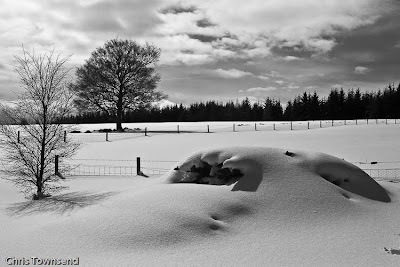 Yesterday evening as the blizzard still raged there was a power cut that lasted for two hours. Camping gear comes in useful here and I soon had soup heating up on a little gas burner and a lantern lighting the kitchen. With plenty of logs and coal for the solid fuel stove the house was warm and a wind-up radio kept me informed of all the closed roads, trapped trains and power cuts. For me this snow has been a minor discomfort, for others it has been a real problem. And for wildlife the whole winter has been terrible.